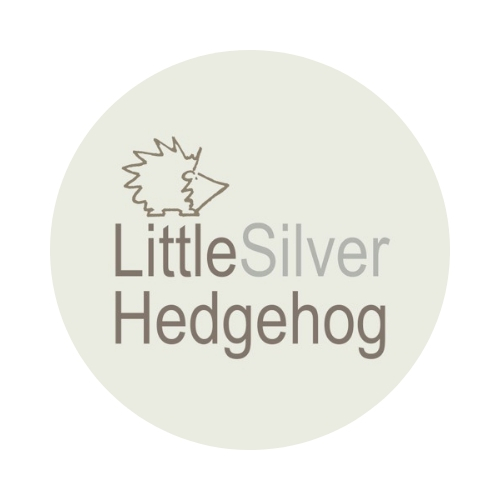 Welcome to Little Silver Hedgehog. I create handmade silver nature jewellery inspired by nature, wildlife and the plants and flowers that flourish in my wildlife garden. My silver jewellery raises funds to support my hedgehog charity and work to save our declining wild hedgehogs. Hedgehogs numbers in the UK are in sharp decline and there are thought to be less than a million left. I’ve filled this website with information and advice about how to help hedgehogs, including what to feed wild hedgehogs and how to make your garden hedgehog friendly. I love gardening and have designed my own wildlife garden packed with insect and hedgehog friendly features. You will find lots of information in the ‘Helping hedgehogs’ section of my website and also on my blog. If you are a hedgehog rehabilitator, you may also find my section on ‘helping sick and injured hedgehogs’ useful. Please visit my online jewellery shop. My hedgehog work is entirely self funded. If you find the information on this site useful, please consider supporting my work. Lovely to meet you and thank you for helping save our wild hedgehogs. I create nature jewellery inspired by British wildlife and the plants and flowers in my wildlife garden. It is all handmade in solid silver and supports my work helping to save our wild hedgehogs. Hedgehog numbers are in sharp decline. Find out more about the causes and how you can take action to help save them. Find out how to support my work helping to save our wild hedgehogs. Like all wildlife rescues, my work is entirely self-funded.